If, like our editor, you’re always losing pens – then you love to receive more as a corporate gift, premium, or just because your client loves you. 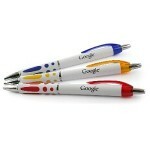 When we saw this wonderfully colourful, and irrepressibly cheerful custom printed pen that Google are doing, we just had to grab one for our own use. Product Color What would you like?